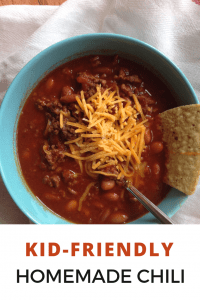 If you’re looking for an easy homemade chili recipe or kid-friendly chili recipes, look no further! I’ve perfected this recipe over the last 10 years, and it’s easily one of my top go-to meals when it comes to hosting another family for dinner. 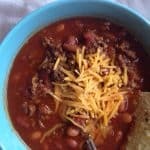 It’s also a great basic chili recipe for feeding a crowd. I am a big fan of Todd Wilbur’s Top Secret Recipes cookbooks. In it, Todd recreates copycat restaurant and product recipes so people can cook them at home. I’ve used that cookbook to make copycat versions of Pace Picante sauce, Applebee’s appetizers, Pizza Hut crust, and more. But my favorite recipe in the book is Todd’s version of Wendy’s Chili. I’ve always loved Wendy’s Chili — in fact, it’s what I order any time I go there. Being able to make it at home makes me happy. 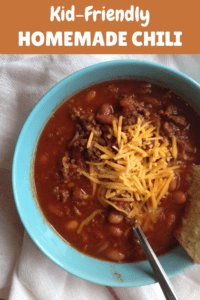 Make sure to download my chili menu, grocery list, and prep timeline for entertaining below! Over the past 20 years, I’ve tweaked Todd’s recipe to make it my own. First, I change up the spices a little. I halve the chili powder to keep it kid-friendly even though I, myself, would love to keep it spicy. I have the bad habit of spice-ing out my family, so, I’ve learned to take it easy in order to keep the masses happy. I also add some garlic powder because in my opinion, everything is better with garlic. And my guests seem to agree. Second, I’ve stopped adding onions. Yep, this is a chili without onions. We invite over a lot of families with kids, and so many kids don’t like onions that it makes sense to leave them out. But another reason is that it speeds up the recipe. If I don’t include onions, then I don’t have to take the time to cut them up or saute them, saving myself 5-7 minutes, which may not sound like a lot but can really make a difference. Onions do add a lot of flavor, though, so to make that up, I add onion powder instead. And third, I simplify by using a can of tomatoes and green chiles (Rotel or generic) and use crushed tomatoes for a little texture. 2. Add beef and all of your other ingredients to the pot. 3. Bring to a simmer and cook for 1 1/2 hours, stirring every 15 minutes or so. 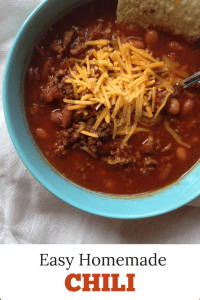 When I’m fixing chili for company, I often fix it in the slow cooker or the Instant Pot. It’s so nice not to have to worry about cooking last-minute when people are arriving. Brown the ground beef in a skillet and then add it and all the other ingredients to your slow cooker. Cook it on low for 6-8 hours or on high for 3-4 hours. Brown the ground beef in the IP, drain it, then add all the other ingredients. Set the IP to High Pressure for 15 minutes and then Quick Release. 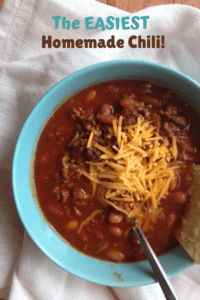 Chili, while it may feel a little casual, is the perfect meal to serve friends who come over for dinner. It’s easy and fast to make — only 15 minutes of hands-on time and all you have to do is brown some ground beef, open some cans, and shake in some spices! Both kids and adults love it, and it’s a great meal for feeding a crowd. Just set out a stack of bowls, the pot of chili, and all of your favorite toppings and let everyone walk through buffet-style to make their perfect bowl. Like soups? 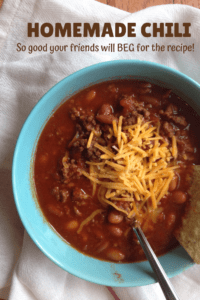 Try my Vegetable Beef Taco Soup! Looking for other great recipes for your next dinner party? Read 13 Best Cookbooks for Entertaining! Make sure to pin this recipe to try later and let me know how you like it! 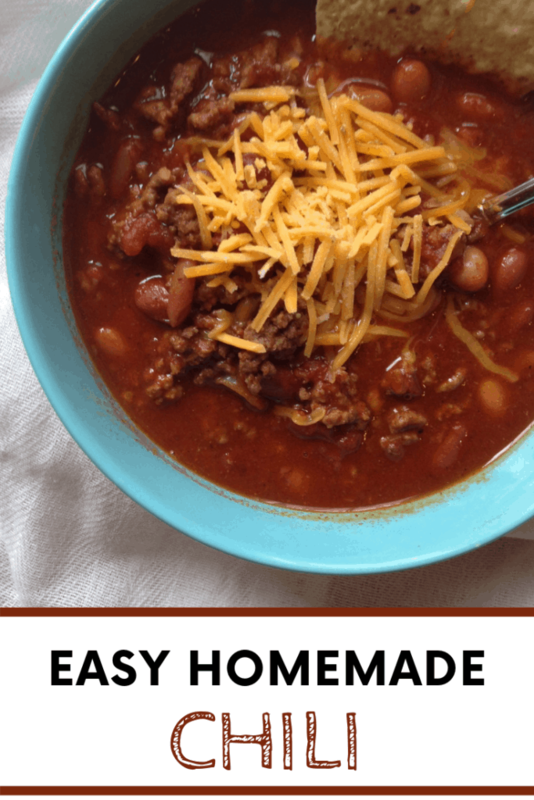 Filled with hearty ground beef, tomatoes, two kinds of beans, and the perfect blend of spices, this chili is easy but so tasty. You can make it on the stovetop or in a slow cooker -- try it today! Brown ground beef in skillet. Drain fat and add the ground beef to an 8-qt. stockpot. Open cans of tomatoes, kidney beans, pinto beans, and tomatoes with green chiles and pour them into the pot. Bring to a simmer and let cook for 1 1/2 hours, stirring every 15 minutes or so. Serve with cheese and your choice of toppings. Slow Cooker Instructions: Brown ground beef, add all the other ingredients, and cook for 6-8 hours on low or 3-4 hours on high. I still have that recipe in my recipe box! And I think I remember your serving us chili when we passed through St. Louis and visited you when you were in grad school! 😀. The rice really does stretch it too!! Lots of good memories there! 🙂 Thanks for stopping by, Jessie.